Safety Speed Manufacturing will formally introduce its SPM301HD Screw Pocket Machine as part of a of a cut, bore, band and assemble manufacturing cell during the AWFS Fair, July 19-22 in Las Vegas. 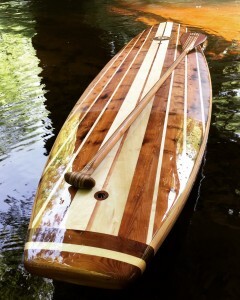 In addition to seeing Safety Speed’s lineup of American-made technology in action, woodworkers visiting booth #8211 can enter to win a custom wood stand-up paddle board manufactured by Shore Boards. Safety Speed will team up with Conquest Industries of Santa Fe Springs, CA, to make bookcases in the manufacturing cell demonstration. Panels will be cut to size on a Safety Speed 7400 vertical panel saw, bored on a Conquest 23 spindle line boring machine, edgebanded on a Safety Speed 72GP glue pot edgebander, and assembled using the SPM30HD screw pocket machine. Demonstrations of the manufacturing cell are planned for 11 a.m., 1 p.m. and 3 p.m. Wednesday-Friday and 11 a.m. and 1 p.m. on Saturday of the show. Houska said the bookcases will be donated to a local charity. The manufacturing cell will anchor Safety Speed’s booth, which will also include widebelt sanders and the company’s flagship vertical panel saws and panel routers. Need more convincing to stop by Safety Speed’s booth?